New laser devices mounted on Russian icebreakers, which would cut through the ice as they plough their way through the frozen seas, may soon support Russia’s bid for Arctic dominance. “We were the first to prove that such a solution is both technically feasible and economically sound,” said Lev Klyachko, head of TsNII Kurs - a Russian developer of maritime equipment ranging from electronic warfare weapons and amphibious armor kits, to radar and satellite navigation instruments. “The idea behind the device it to have a powerful laser cut through the ice ahead of the ship, which allows it to easily break through,” he told RIA Novosti in an interview. The project is expected to be ready for prototyping next year and is supported by one of Russia’s ship designers that specialize in icebreakers, Klyachko said. The company is also developing an advanced radar antenna that would be on a par with traditional phased array antennae, but would be much cheaper, he said. And another project developed for the Russian military seeks to utilize electromagnetic fields to effectively block the effect of EMP (electromagnetic pulse) weapons, he added, saying he was not at liberty to discuss it in detail. “I can only say that this work is welcome due to the practical necessity of our client,” Klyachko said. Russia has the largest icebreaker fleet in the world and is the only nation to use nuclear-propelled icebreakers. 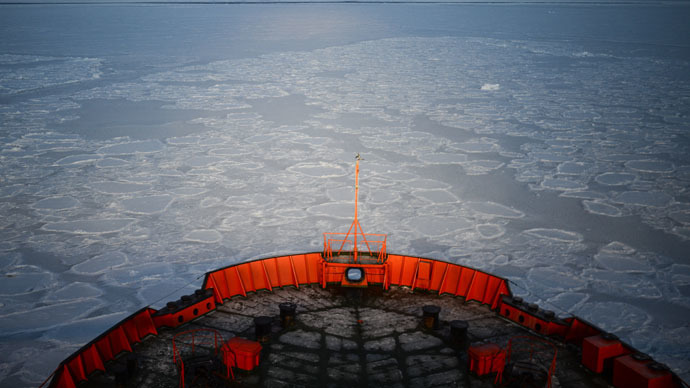 With climate change making the Arctic region more accessible, Russia sees its development a priority both for the sake of its natural resources and as a potential route for transport vessels from Asia to Europe.